The only true stand by is Stevia and some people don’t like the bitter back taste. But the only other option I can think of is Xylitol and the jury is out there too. Here’s a link to Dr. Mercola’s site about it being toxic to animals. If it’s toxic to animals, it makes me wonder about human consumption but I will continue to look for more info on the subject. Darn!! We just can’t seem to win can we? We must find a way to satisfy that sweet tooth! In my opinion, you are better off to use a small amount of honey or maple syrup, if you are looking for the occasional sweet thing. Or allow the dreaded white sugar very occasionally. The down side to frequent use of aspertame, xylitol, nutrasweet etc. far out weighs the effects of a bit of white death. Maybe think of it this way…if you like to sweeten your tea, coffee et al, use stevia or a touch of honey or maple syrup. I would hope you aren’t drinking 20 cups a day! One or 2 cups with a touch of honey per day, isn’t too bad. Or maybe learn to drink it without…lemon in your tea instead or something like that. Once a month have the dessert of your choice…pull out all the stops but only once a month! I’m not suggesting this to people that have known sugar handling issues. If you are really needing the sugar fix, I’d like to suggest to you that you may be missing something and may want to consider this. One of the major things we find when testing people are sugar handling problems. It’s huge! That’s why Biotics and our other nutraceutical companies make products to deal with this modern phenomena. Biotics make Bio-Glycozyme Forte that can be used like a Multi Vitamin to help support your blood sugar…that’s what you are really looking for when you want the sugar is the lift you get…BUT remember it’s an artificial lift that drops you down again and then you are looking for the 3rd Mars bar of the day! BioGlycozyme will give you body the nutrients to stop this reaction. Email us if you would like to order this. 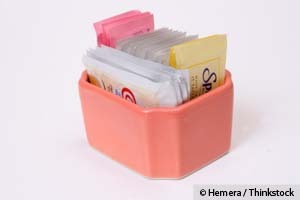 Just when we thought we had all this figured out…here comes another artificial sweetener to try to confuse us again! Watch out it’s on the market and it’s called Neotame! Here’s some notes from Dr. Mercola’s site about it and a link. One of the more recent toxic additions to our food supply is the artificial sweetener called Neotamei. In the European Union, where it was approved as a flavor enhancer as of November 2010, it is known by its “E number,” E961ii. It’s based on the aspartame formula—despite the fact that 80 percent of all FDA complaints pertain to adverse reactions from aspartame. Neotame is essentially aspartame plus 3,3-dimethylbutyliii–the presence of which ends up reducing the production of phenylalanine, which allegedly makes it safe for those suffering from phenylketonuria (PKU). Unfortunately, it may actually be an even more potent and dangerous neurotoxin, immunotoxin and excitotoxin than aspartame. Click the link to Dr. Mercola for more. AND…don’t use Neotame! Tomorrow I will post some recipes using Stevia on the Nutrition in a Nutshell blog.